What equipment is used for outdoor climbing? It’s always best to start climbing outdoors in the company of an experienced climber. You could join a club, book a course, hire an instructor/guide or go with a suitable friend. This means your first climb will likely be on a top rope or seconding an experienced leader and you’ll need the same basic equipment as you would to climb indoors: a climbing harness, a belay device and suitable climbing shoes. • A well-fitting climbing helmet. Some climbers make a personal choice not to wear a helmet, but when starting out it’s better to play it safe until you become better at judging risk. • Outdoors clothing and walking shoes or boots. Getting to an outdoors crag can involve muddy paths and rocky terrain, and once you’re there it can be windy or even wet, so take shoes and clothing to keep you warm and dry. • A guidebook. Real crags don’t have coloured holds to show you the route, so a good guidebook helps keep you on track. • Water, food and a thermos of tea. Time passes very quickly outside and elevenses will be upon you before you know it! There will be many more things you will need as you progress in your climbing career. 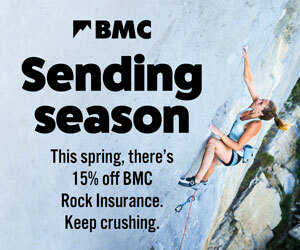 Once you take up lead climbing, you’ll want your own rope and a rack of protective gear. If climbing on bolted routes (known as sport climbing) this will mean lots of quickdraws, one or two slings and a few screwgate carabiners. For traditional climbing (where there is no fixed protection and the leader places protective gear as they go) you’ll need to add some nuts and hexes, more slings, and possibly some camming devices as well. Climbing outdoors can be one of the most thrilling and satisfying forms of climbing, combining the gymnastic styles of indoor climbing with being outside in the great outdoors, close to nature and sometimes in adventurous environments. Because of falling objects and rockfall and all sort of bad falls there is always a risk of head injury. No climber is experienced enough to climb without helmet, but some are stupied or arrogant enough. Terrible method of coiling rope. Seems they never have dirty or snowing or frozen rope. Why put it on neck, when you can exactly same in hand? And one more bad thing with coiling by 8 form rope: when you throw it from rock it do not fly well.